The incident was re-enacted the following day in daylight. Here, the FRB is on its way under the rig. A 40-year old Scottish engineer from the semi-submersible rig, the Scarabeo 8, working for ENI Norge in the Goliat sector can thank his lucky stars – and ESVAGT – that he is still alive. Early in the morning of the 20th of February 2015, the engineer fell through a hole in the gangway on the rig and landed 13 metres below in the cold, dark Barents Sea. 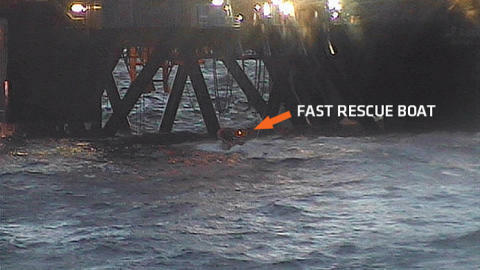 A colleague saw the incident and raised the man-overboard alarm. The alarm summoned the ‘Esvagt Aurora’, which was on standby about a kilometre away from the rig. The “Esvagt Aurora” received the report at 4:11 a.m., launched its high-speed rescue boat into the water at 4:13 a.m. and rescued the man from the water at 4:17 a.m.
Three minutes later, he was brought on board the ‘Esvagt Aurora’ and received initial treatment in the vessel’s hospital. By then his body temperature was very low. At 6:25 a.m., he was flown by helicopter to the hospital in Hammerfest and was discharged again two days later. The report from the Norwegian petroleum supervisory authority (Norsk Petroleumstilsyn) on the incident describes that even a marginal change in circumstances could have cost the engineer his life. ENI Norge has expressed its thanks to the shipping company and the crew of the ‘Esvagt Aurora’ for an “extraordinary and remarkable operation”. “We are proud to have made a difference,” says Ole Ditlev Nielsen, Chief Commercial & Safety Officer for ESVAGT. Since 1981, ESVAGT has assisted with 45 rescue operations and saved 128 people.